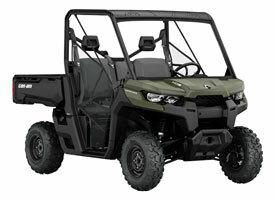 Pioneer Offroad Rentals offers UTV/side by sides when you need to carry multiple riders and possibly a small load of cargo the Polaris Ranger XP 900 and the Can-Am Defender are versatile and rigged to meet your offroad worksite needs. These machines are versatile; ideal for carrying personnel and equipment across open fields and through the bush with minimal environmental disturbance. These UTVs are low maintenance, fuel efficient and can cover longer distances, making it a reliable and environmentally-friendly option. Dimensions L: 119" H: 79: W: 63"